Over time, the viscosity of your oil will break down. The main purpose of the oil in your car is to keep your engine parts well lubricated to avoid friction. Without the oil, or with broken down oil, the friction causes your car parts to rub against each other. This friction can cause minor to major problems. After some time, parts can chip, crack, or completely break down. Frequent oil changes are the easiest and cheapest ways to prevent these problems from occurring. The oil keeps the system lubricated and protected from the wear and tear. Regular oil changes can keep most cars running perfectly over 100,000 miles. Since you should be getting at least 4 oil changes a year, it’s important to keep the prices down to help out your bank account. Meineke oil change coupons will help keep these regular visits less expensive, keeping more money in your savings. “You won’t pay a lot, but you’ll get a lot at Meineke.”George Foreman has been the Meineke spokesperson since 1993 saying those exact words in some popular TV commercials nationwide. Meineke is known for providing many great money saving coupons for their variety of products. You can find oil change coupons, tire rotation coupons, and coupons for brake service among other services. shops. They also heavily advertise their oil change coupons in magazines, newspapers, and weekly coupon circulars. Another great resource is to print an oil change coupon from your computer that you can use right away. 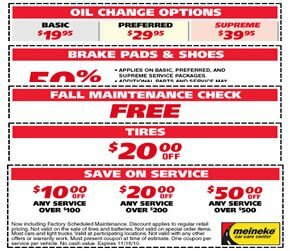 The preferred choice oil change and supreme oil change Meineke coupons also often offer free roadside assistant. Meineke offers three different types of services for oil changes. These are all categorized as “basic”, “preferred”, and “supreme”. Each of the options builds upon the last one, kind of like a bronze, silver, and gold package. If you feel you need a synthetic oil change, you can opt for synthetic oil with any of the options for an added fee.